Asia-Pacific Rural and Agricultural Credit Association (APRACA) is as association of finance related institutions in the Asia-Pacific Region involved in rural, agriculture and microfinance as well as policy and development. It was formally launched 1977 and is celebrating 40th foundation year in 2017. 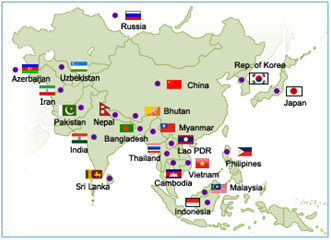 As of March 2016, a total of 78 institutions in 21 countries in the Asia Pacific Region are affiliated with the APRACA as its members. APRACA is working with three agencies i.e.Center for Training and Research in Agricultural Banking (CENTRAB), APRACA Consultancy Services (ACS) and APRACA Publications. APRACA is the organization on rural and agricultural finance that helps promote productivity, inclusive growth, self-reliance and welfare of the rural poor in the Asia-Pacific region. To promote the efficiency and effectiveness of rural finance and improve access to financial services through a network of knowledge sharing and learning, capacity-building, research and exchange of expertise. APRACA Center for Training and Research in Agricultural Banking, Inc. Prepare an ACE work plan to include a) conduct of research studies, b) conduct of forums, training courses and exposure visits c) provision of consulting service and technical support d) pilot testing of innovations , e) development technical and training guides. Identify a core of training specialist and technical experts. Publish appropriate material in printed or virtual form. Prepare and design regional proposals in coordination with APRACA Secretariat. Prepare individual activity reports for submission to appropriate APRACA agencies.